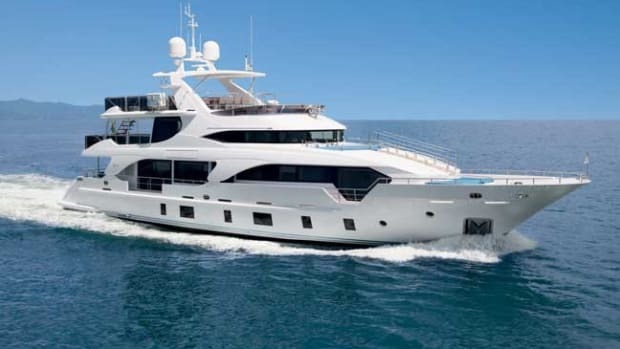 Nobody does semi-custom quite like Benetti. 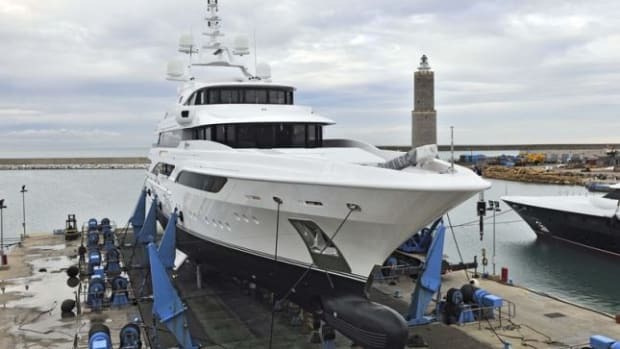 Since the late ’90s, when the first Classic 115 showed that you could have your own personalized superyacht without having to wait three years for it, the Viareggio shipyard has been kept busy building innovative, conservatively styled, displacement fiberglass motoryachts in an ever-increasing range of sizes. 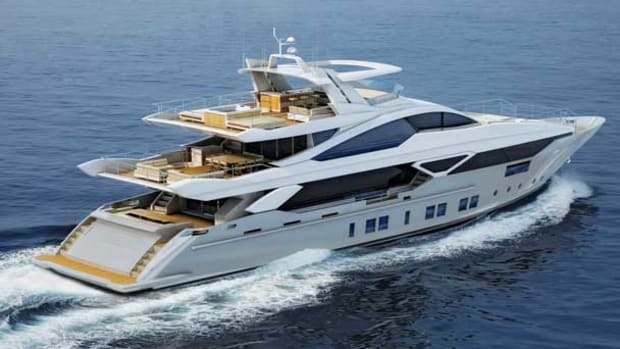 The latest development of the Tradition line, embodied in the 108-foot (32.9-meter) Tradition Supreme, has a distinctive profile, with a carbon-fiber radar arch and hardtop, and a fully extended sundeck, which not only adds relaxation space but also shelters the upper deck more effectively than on the 100 and 105 Tradition designs. The first 108 was built for an experienced owner. 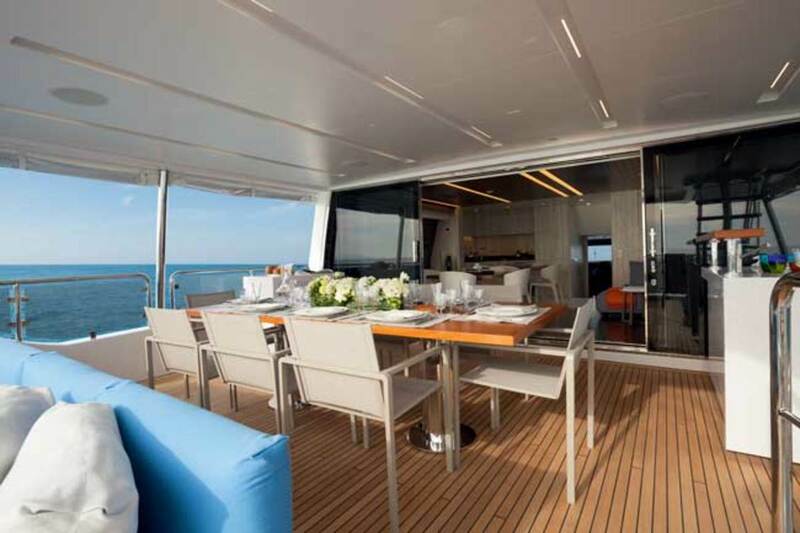 His previous yacht was a Benetti—a 100-foot (30.4-meter) Tradition built in 2006—but he can trace his boat ownership back to his childhood on the beautiful lakes of Lombardy in northern Italy. He knows exactly how his new charge will be used. Unusually, he is also an owner-captain. 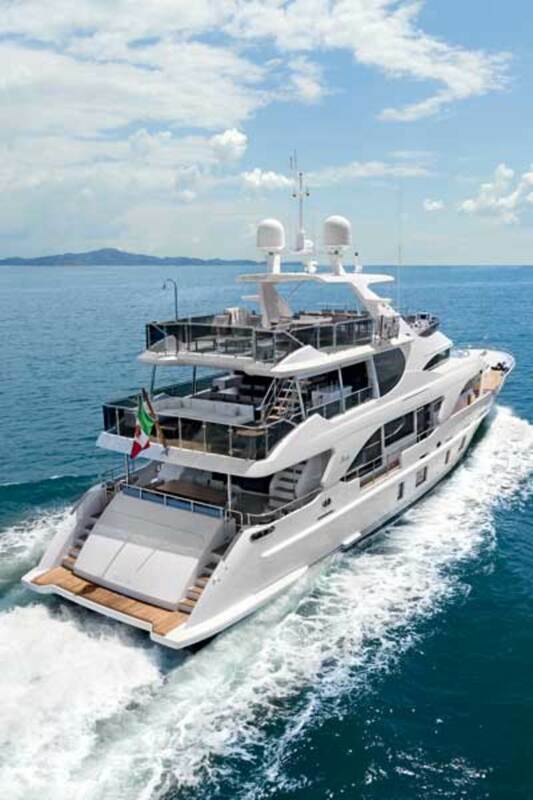 The family does hire crew, but not a full complement, preferring to take on most tasks themselves, and Benetti has customized the yacht according to many of their individual ideas and requirements. There is a Turkish bath on the upper deck, for example. 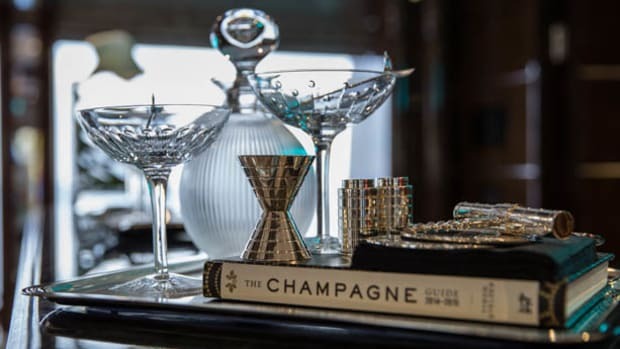 And with no formal dining table on the main deck, making the salon feel vast, most meals will be taken while enjoying the views from the upper salon, served from the galley below by dumbwaiter. While the Tradition’s exterior styling comes unmistakably from the pen of Stefano Righini, the interior of this first 108 was designed by the shipyard studio under the owner’s direction. She’s been fitted out with attractive mosaic tiling in the showers contrasting with pale striped marble, for example, and heavily grained, limed oak used on the bulkheads offset by areas of darker veneers and brightened by a multitude of colorful fabrics. 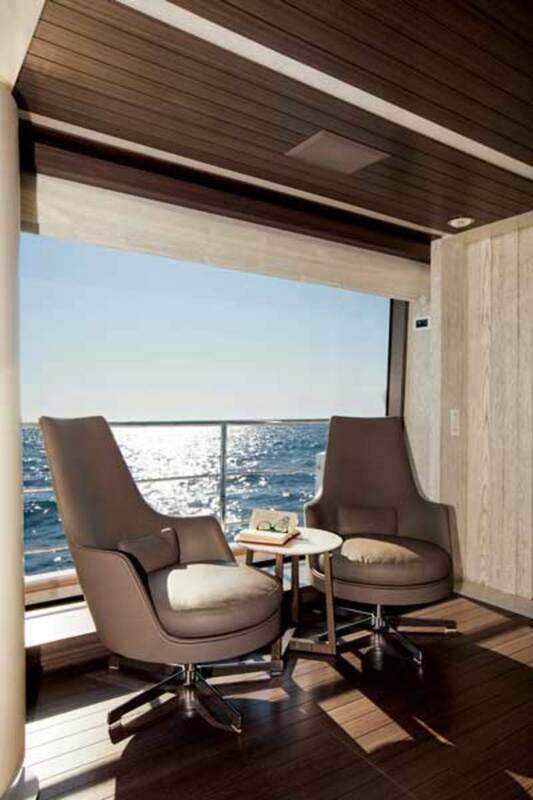 Cutaway bulwarks match the main-deck window shapes, and maximize both daylight and spectacular views in the salon and owner’s suite. 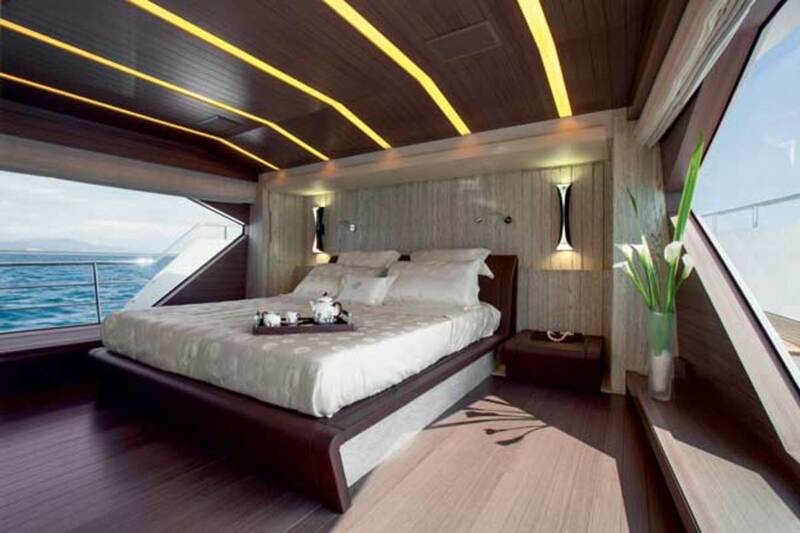 Longitudinal overhead lighting is found throughout the main deck. 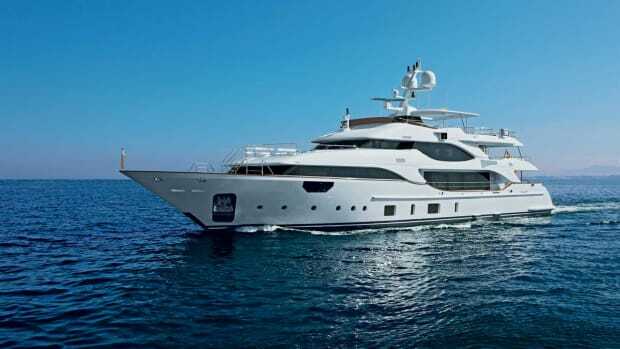 Apart from the owner’s changes to the salon, the yacht is built according to Benetti’s standard layout with four ensuite guest cabins down below, in addition to the owner’s suite on the main deck and six crew berths in three cabins forward. 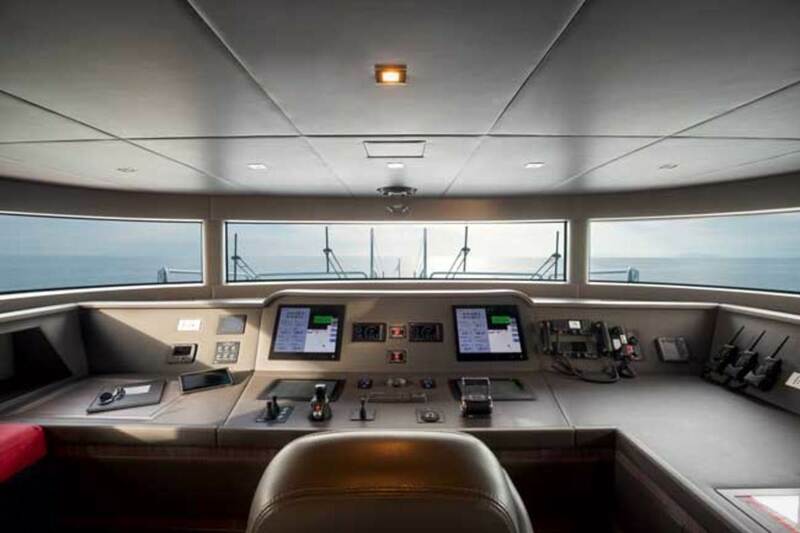 The full sections of a displacement hull help to give the interior spaces pleasingly comfortable proportions, along with plenty of useful stowage in the sleeping areas, full-size beds and a minimum of 6-foot-4-inch headroom everywhere. 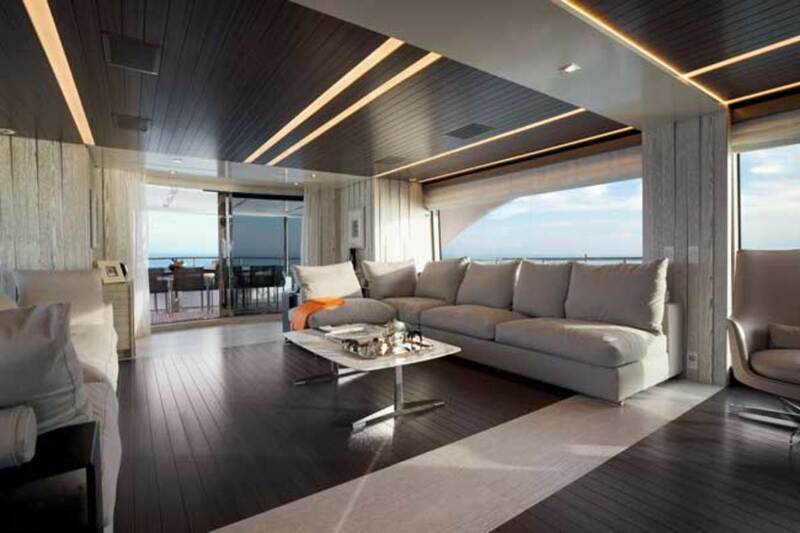 Displacement yachts are also less subject to the tyranny of weight than their faster counterparts, and the 108’s interior fit-out has a reassuring solidity. 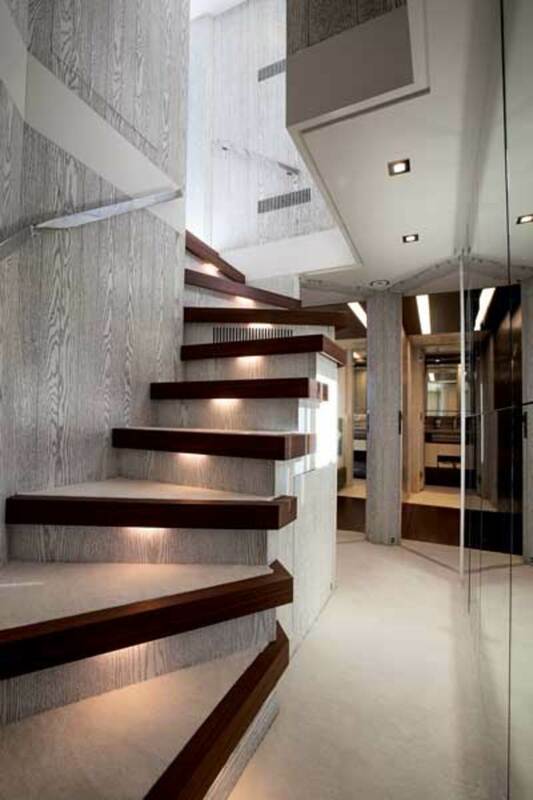 The owner’s customized interior décor fades into insignificance compared with what he asked the shipyard to do in the engineroom. 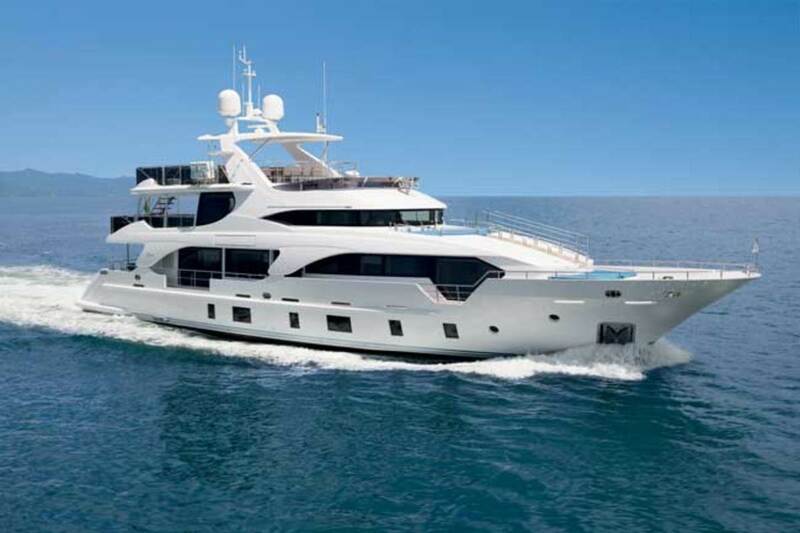 Benetti describes this first 108 as a hybrid, although not in the sense that she has vast battery capacity and a zero-emissions mode. 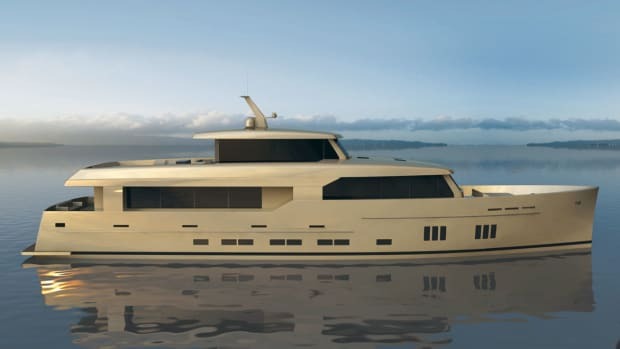 This is a traditional displacement yacht with a traditional twin-diesel power plant, supplemented by—you guessed it—a “traditional” diesel-electric propulsion system: two electric motors powered by two diesel generators. 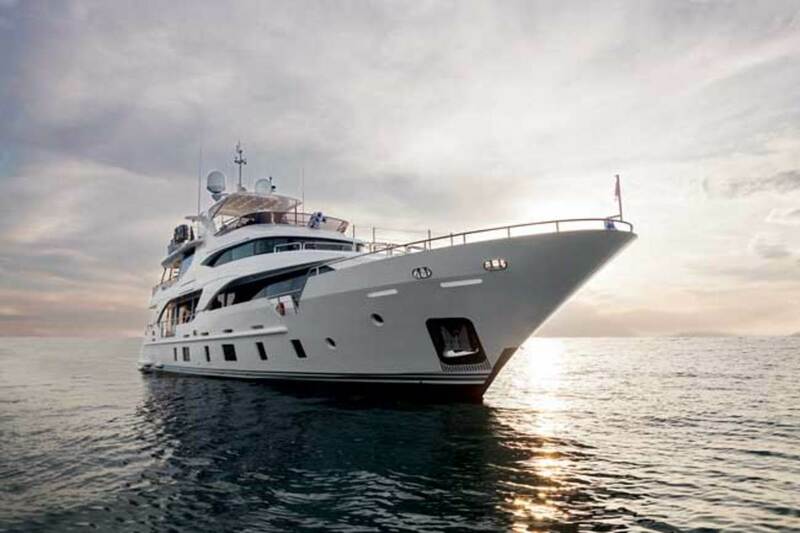 With her slippery, round-bilge underwater shape, the Benetti 108 would be well-suited to diesel-electric as her sole propulsion system, but the advantages of fitting both diesel and diesel-electric are not immediately obvious. It sounds complicated and expensive, and it is. 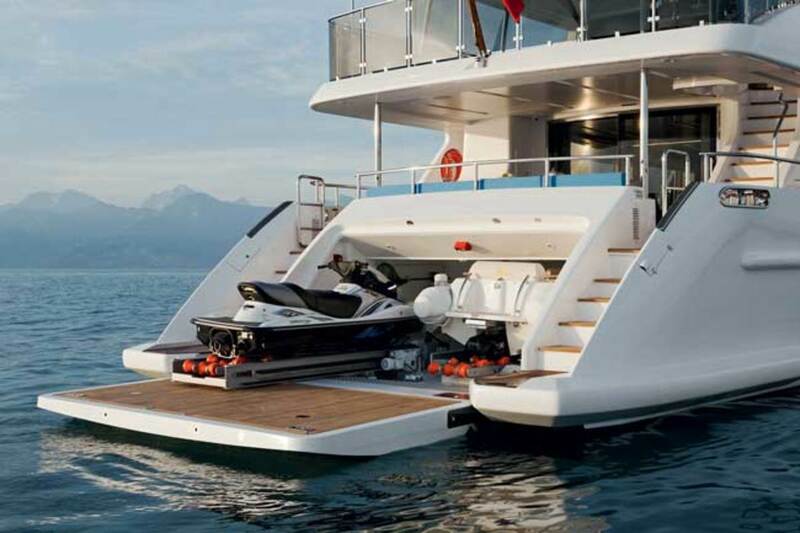 This is a yacht with four diesel engines and two electric motors, plus gearboxes capable of dealing with both power sources. 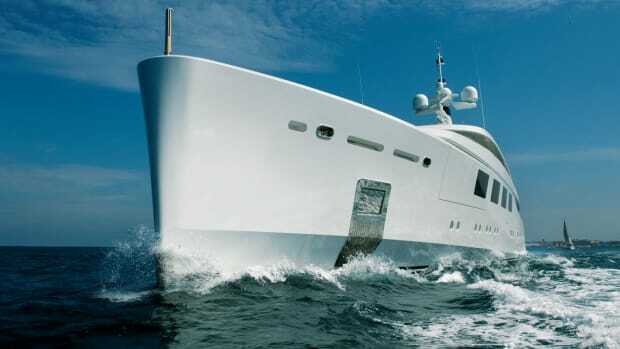 The big 80-kilowatt generators fitted are run by modern 4.5-liter John Deere engines, and with both of those powered up and both 35-kilowatt electric motors engaged, we recorded a maximum speed of 5.5 knots while burning about 10½ gallons per hour. You could probably do better than that by reducing the demand on the generators—we had stabilizers, TV, a/c and lights on—but it’s a “real world” idea of the 108’s electric performance. The real advantage of the diesel-electric system is its quietness, although even under conventional power, the 108 proved to be a surprisingly silent operator. At full speed on the main engines we could not only hear the air conditioning in the wheelhouse, but also, surprisingly, the soft hum of a battery charger in one of the lockers. Having switched those off, we recorded a remarkably low 58 decibels in the wheelhouse, which is lower than normal conversation levels. But then we switched the main engines off and transferred to electric power. The sound meter’s needle dropped to a barely registrable 47 decibels. My laptop is louder than that. While on a walk-through of all the accommodation areas, on both the main and lower decks, the needle never flicked above 50 decibels. It’s quite extraordinary, but it’s exactly the effect the owner wanted and expected. 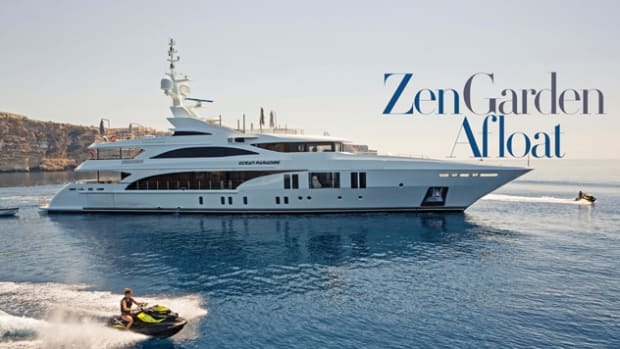 “Hybrid propulsion allows for completely silent sailing whenever there’s the need to travel without haste—lengthy deliveries, relaxed coastwise cruising where you want to enjoy the panorama, night-time sailing,” he explained. 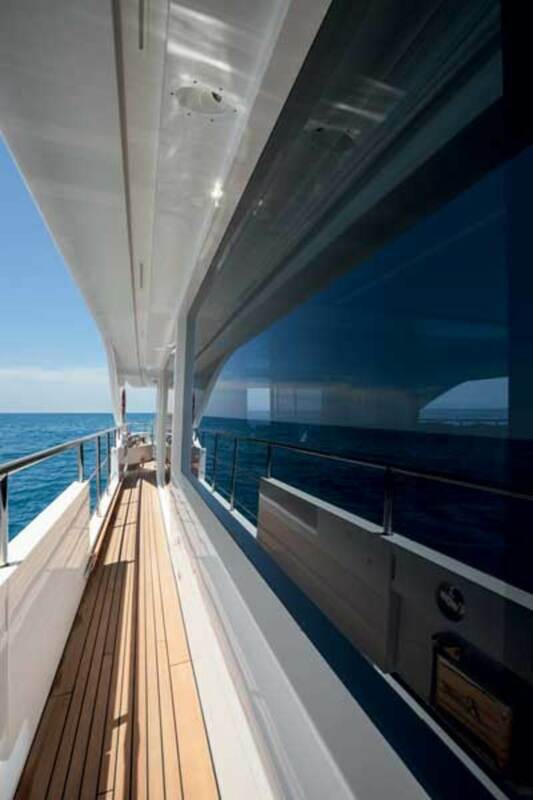 Using the yacht in electric mode, particularly at night under the stars, promises the sort of unforgettable passagemaking experience hitherto only possible on a sailboat whispering along on a zephyr of breeze. 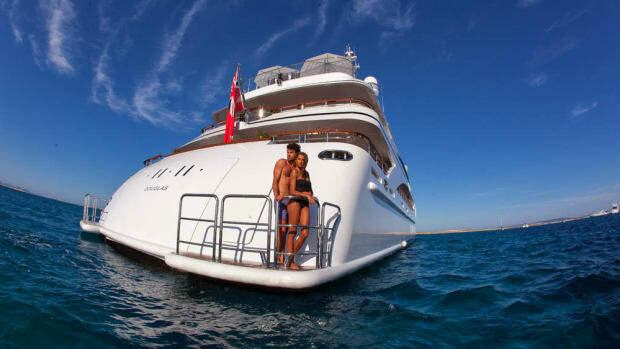 The owner’s family had a relaxed first cruise on their new yacht before the fall boat shows, breaking her in gently. “We spent our first season relaxing in Sardinia, without stressing the yacht,” the owner explained, before turning his thoughts to the future. It seems they’ll go east next summer and head for the classic cruising grounds of Greece and Turkey. After that, things look set to get even more adventurous with some challenging passagemaking on the agenda, all the way up to northern Europe.